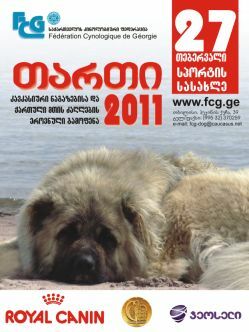 Tbilisi Sports Palace hosted the National Specialized Kavkazskaia Ovtcharka and Georgian Mountain Dog breeds Dog Show "TARTI 2011". The Show was organized by Club "Bombora" and had a great success as pointed out by the ring judges Mr. Vadim Katsnelson (Ukraine) and Mr. Mamuka Chaobashvili (Georgia). More than a hundred of dogs were registered for the Show.